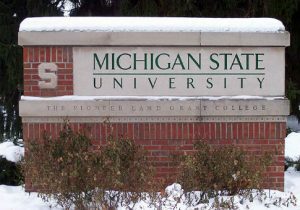 The Michigan State University administration condemned the appearance of a "noose" in a dormitory on Wednesday, calling it a racist symbol and a threat. "I was distressed this morning to learn of a racial incident in one of our residence halls," MSU President Lou Anna Simon said in a statement. "A student reported a noose was hung outside of her room. I want to recognize the courage it took for the student to report this incident." "I want to be clear: This type of behavior is not tolerated on our campus," Simon continued. "No Spartan should ever feel targeted based on their race, or other ways in which they identify. A noose is a symbol of intimidation and threat that has a horrendous history in America." Student president Lorenzo Santavicca agreed, calling the incident "disgusting." "There is absolutely racism on our campus that we have to address. We have to do better," Santavicca told the student paper the State News. But later in the day, MSU police announced that the "noose" discovered by the student was actually a shoelace and they had located its owner. In a press release, MSU spokesman Jason Cody said the leather shoelace was "packaged in a way that someone could perceive them to look similar to a noose." "Also, the original shoelace found inside the residence hall was not directed at any individual," Cody continued. "It originally was seen on hallway floor and later on a stairwell door handle, where officers believe someone put it after picking it up." The controversy comes after University of Maryland police were called in June to investigate a "noose" on campus that turned out to be a piece of plastic wrap.